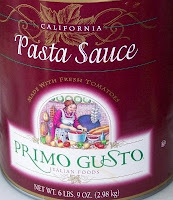 Years ago, Sam's club had a really good pasta sauce, really cheap. When they discontinued it, I tried to find it elsewhere, and was unsuccessful. Not so long ago, Meijer's had a premium house brand pasta sauce that was really good, in several varieties, at about the same price as cheap sauce. Unfortunately they have shuffled their product line. They now carry a generic sauce, and a super-premium at twice the price. Most of the time if sugar or corn syrup is not in the top 5 ingredients of a pasta sauce, it will be at least a little better than average, and if there is no added sugar it will be pretty good. We were at Gordon Food Service and I checked the ingredients on their gallon cans of pasta sauce--No sugar! I bought a can, and it is really good sauce by itself. (Full disclosure--I haven't found a bottled sauce that isn't better with some fresh garlic and anise or fennel) The price is right too--Under $6 per gallon. The downside is that like a lot of Gordon products, you can't get less than a gallon.